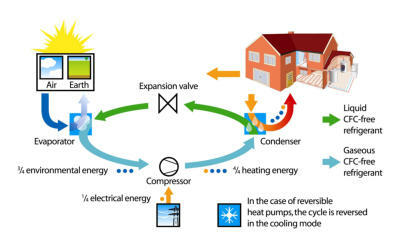 Air Source Heat Pumps A Heat Pump is an air source heat pump and the technology inside it is very similar to a domestic fridge. It basically transfers heat from one place to another - the back of a fridge is warm because it is removing heat from inside the storage space to the room. 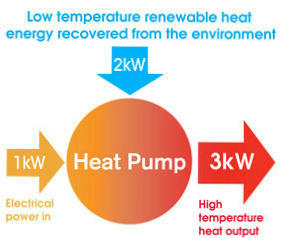 A heat pump removes warmth from the air outside and transfers it inside the home to heat radiators or water. The advanced heating technology used in heat pumps make them ideal for use in the UK’s ambient temperatures and hence perfect for the domestic market. The main components in the heat pump are the compressor, the expansion valve and two heat exchangers (an evaporator and a condenser).